Jim Rainey has been publisher of the Opelika-Auburn News since December 2002. He also serves as news leader for Media General newspapers, television stations, and affiliated websites in the Gulf South Region. Since 2002, the News has won the Alabama Press Association’s General Excellence Award six of the past seven years. In 2006, the Newspaper Association of America’s Presstime Magazine named Rainey one of the nation’s top 20 newspaper professionals under the age of 40. 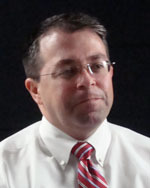 Rainey came to Lee County from Atlanta, where he was associate publisher of the Fulton County Daily Report, an American Lawyer Media publication.